We are super excited to be welcoming back world-renowned faery artist Amy Brown to Jet City Comic Show! Amy hasn’t been to JCCS as a guest since 2012, which our last year in Seattle. So we’re quite excited to have her at the Tacoma Convention Center. 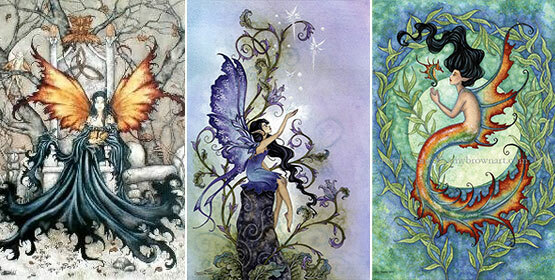 Amy Brown has been painting faeries since 1992. Amy began by selling prints and originals at street fairs and in local shops for a few years, before opening a website and began selling my work online worldwide. Business seemed to take on a life of its own and has evolved naturally ever since. It’s been over twenty years now, more than 2000 paintings, and dozens of licensed products and I’m still trailing behind helplessly as the Faeries drag me on in a seemingly endless rampage. Her watercolor designs have appeared on T-shirts, calendars, buttons, tattoos and well has having multiple art books. She will appearing only on Saturday, November 3rd.